after stumbling upon this soup, i have made it THREE different times. THREE. that is a lot of times for me to make something in a few months time. just sayin’. i have modified the original recipe to make it a bit easier to throw together. the amts below will work for about 4 people. double, quadruple, as needed. i have also made a few modifications to the original, mainly with the sauteing oregano in evoo. for the first time, i didn’t have fresh oregano on hand and used the dried stuff, as a substitution. it burned and did not turn out all that well. i never really tried it again and can’t taste that the soup is missing anything. also, the jalapeño does not add much heat, so don’t be intimidated. on to the recipe! cook pasta, 1-2 minutes shy of package directions. draine/rinse in cool water and set aside. par boil chicken and shred it, set aside. 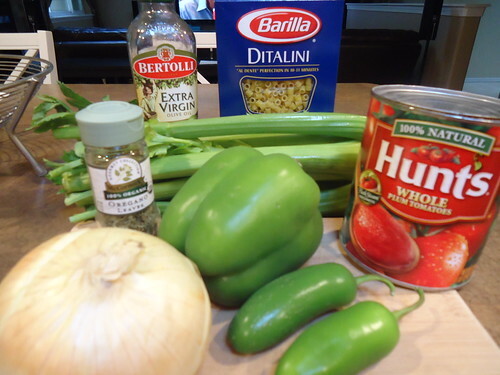 in your soup pot, saute onions, green pepper, celery, jalapeño and dried oregano with evoo. cook until golden brown, for about 10 mins. add chicken broth, chicken and tomatoes (with their juice). if you have a parmesan rind on hand, throw it in the pot at this point, too. it gives a wonderful nutty flavor to the soup. bring to a boil and then reduce to a simmer. about 10 min before serving, add pasta, cream and stir to combine. simmer on the lowest possible range setting until you serve. 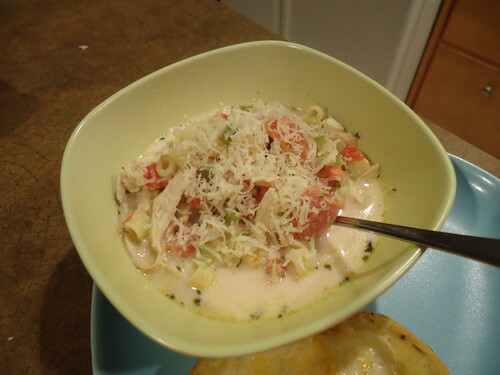 top with grated parmesan cheese and crusty bread.